Zenru.org. What is Second logic? What is the Second Logic? The Second logic is ability to think abstractly in concrete borders. To do it one need (1) to be able to think (to create abstractions), and (2) to be able to set concrete borders of consideration of phenomenons, processes, in other words, to restrict a field of abstract thinking. The first thing is first logic (developed formally-logical thinking). The second thing is "intuitive" binding together of huge quantity of factors, is art. A function (derivation) of layer of modelity, a function of proximity to the basis of awareness, a function of enlightenment. An ability to think abstractly in concrete borders allows one to find so called "opposites" of any phenomenon, to transform them to neatly defined simple internally consistent (in first logic) models. 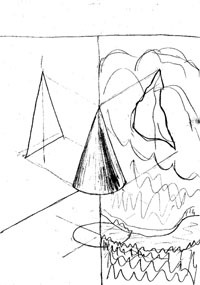 To decompose the cone to "round" and "triangle" in conditions, when "the cone" can not be realized directly, but an idea (notion) about its existence presents clearly. An example. You can not see a cone, if you have not stereoscopic vision. Look using one eye. You will see either only "round" or only "triangle". Ther is no "You can not see DIRECTLY, that it is cone, using (one) eye". But critical mass of rotating of this body in hands in front of eye, critical mass of confirmations, dinamical series (of "critical" lenght) of perceived by you projections of the body will give an idea (notion) about the existence of the cone. In abcense of DIRECT perception of the cone. "A ball rolls down", remeber? :))) A ball rolls down, seek after position of "minimum of dissipation" (minimum of output of energy, minimum of output of entropy). And cools down in it. Or, in other words, in position of "static equilibrium". There is "dinamic equilibrium" also. This is, for example, pendulum. This is, for exmple, a pool with two pipes: flows into one, flows out from another one. If flows into and flows out equally, then a volume of water is not changed. Equilibrium. Hovewer, dynamical one. Because the system is in motion. Hovewer, in equilibrium. In "quiescency". This is it: "dinamic equilibrium"... in other words, "moving quiescency". :)) Everything living beings are "equilibrium dinamical systems". As much energy flows into, the same flows out. 10 - 10 = 0. 5 - 5 = 0. Dinamical equilibrium. 0 - 0 = 0. Statical equilibrium. 10 - 10 = 0. Life. 0 - 0 = 0. Death. This is the difference ("10 - 10" and "0 - 0") of life and death. This is unity ("= 0" and "= 0") of life and death. Yes, well. So. In alive being there is always two opposite tendencies. One is flows into, another one is flows out. One destroys, another one creates. They are (the presence of opposite tendencies) in one object (phenomenon or process) the basis of appearance of life. And it is the most essence characteristic of LIFE. Everything, that we call usually "live being" are "processes in substance". Processes of some level of complexity, existing in the form of stable structures ("in substance"). Their essence is the following: some amount of energy flows in, some amount flows out. Flows out with decreased quality of energy. "Quality of energy" is a term. And "quality" of information too. It characterizes a level of complexity. In other words, a lenght of unique chain-module. avsnyu9uynaNjhc]/avsnyu9uynaNjhc]/avsnyu9uynaNjhc]/ or AbcAbcAbcAbcAbc. The level of complexity of the module. The simplies auto-wave is "steppe fire". After passing of wave, a quality of energy is decreased. "High-energy stuff" transforms to "low-energy stuff". Ashes can burn. Hovewer, in atmosphere of oxygen and in hign initial temperature. In other words, there is energy in a medium, but its quality was decreased. The difference in quality of energy is used to (1) maintenance of the process itself (of auto-wave) and (2) is dissipated in ambient space. So. A process, or "living being", always exists in a form of two oppositions (opposite tendencies), acting simultaneously. But thinking is arranged so that it can operate DIRECTLY only by elements of logicaly (in first logic) consistent picture. In other words, only one of opposite aspects of the process (phenomenon) can be analysed DIRECTLY in every single moment of time. The second opposite aspect remains "inside mind", in other words, it is perceived INDIRECTLY. The Second logic is possibilty "to see" simultaneously two opposite sides of an object in the situation, when there is no possibilty to see two opposite sides of the object. In other words, to evaluate an object (process, phenomenon) at most adequately. So. The machine "Second logic" consits of two psrts: developed formally-logical thinking anf finding of awareness in layer of modelity, begining from N-th (level of complexity of layer of modelity "not less than" = layer, approximated to the basis of awareness "not less than" = level of enlightenment "not lower than"). In other words, it is not a machine, it is an organism. A machine is algorith "in substance". An organism is a process "in substance"... Consisting of two opposite tendencies anf of different organs.